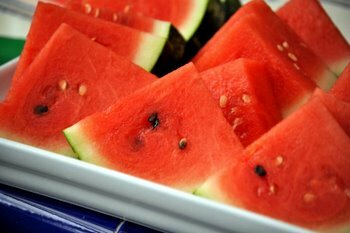 I usually use a big, sharp chefs knife to cut juicy slices of watermelon when it comes into season. They tend to be my sharpest knives and, while occasionally it does take a moment to get purchase on the slick melon rind, they do a good job of slicing in the end. 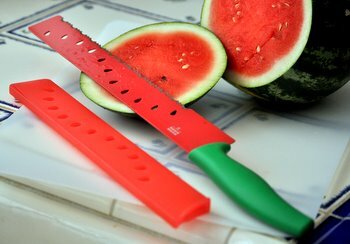 I certainly didn’t need to add a knife specifically for cutting watermelon to my collection – but one look at Kuhn Rikon’s new Watermelon Knife and I simply couldn’t resist. This watermelon-colored knife has a green handle and a red nonstick silicone-wrapped carbon steel serrated blade with seed-shaped holes running down the side – giving it a whimsical look at matches a watermelon. The blade is very sharp and its small serrations easily cut through both the rind of the melon and the flesh. Another positive thing about this knife is that the blade is 11-inches long, which means that it can actually cut all the way across full-sized melons, where shorter knives often struggle. The knife works beautifully and comes with a matching watermelon-colored blade protector to keep those serrations sharp when the knife is not in use – and it also make it easy to transport the knife to picnics safely. I’ll be honest: I bought the knife because I loved its look (and still do! 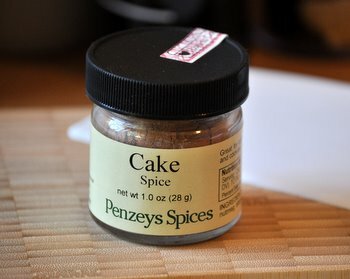 ), but it works very well and I’ll definitely get a lot of use out of it this summer. That knife will be mine! I LOVE IT!! I love how the knife looks and I’m glad it is good at watermelons, but do you think it would be good for other things too? Maybe other fruits and vegies? Cathy – You could easily use this knife to cut breads and other things that are usually cut with a serrated knife. I wouldn’t necessarily use it on small fruit, simply because of its size, but it would be perfect for cutting other melons and squash/pumpkins.